Map for printing Map Plan for "The Maze"
When you take your first trip to Alaska, you will have an opportunity to observe the DHC-2 Beavers in action. Many flights for this area are for the tourists arriving on the cruise ships docking there. The flights are often short (1-2 hours) so people can fully enjoy the experience but get back to the cruise ship before it leaves. During these flights, the pilots often tell wonderful stories about the fascinating scenery you are seeing out the windows of the aircraft. There is a great deal of history in Alaska and many stories to tell (we think some of them are actually true!). Misty Moorings Charters are created to give the 'tourist' in us an opportunity to experience virtual Alaska making it 'as real as it gets.' Just follow the FSNavigator fixes and as you arrive at each of them, read the text that explains what you are seeing out your windows. We hope you enjoy the flights and enjoy the wonders of Alaska [virtually] as though your were actually there. If you are using FSNavigator4, and your aircraft has an autopilot, all you will need to do is takeoff and land along the way. The software will guide you perfectly. There is also a plan (map) for this charter that you can download here. 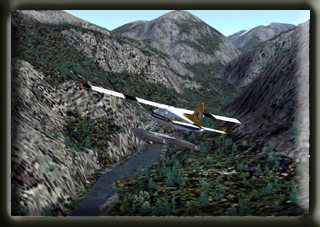 For this particular flight, to trust your autopilot completely, you MUST be using the Misty Fjords scenery package. You can also use the FS9 Flight Planner as it will also guide you to the destinations. Both the FSNavigator (fsn) and FS2004 Plan (pln) files can be downloaded here. An altitude of 2600 feet will get you safely through the mountains using these routes. However, it is more exciting to fly at treetop levels with you controlling the altitude. 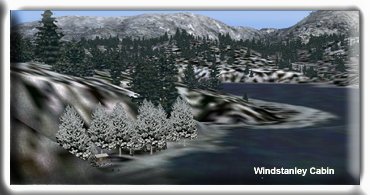 Also, if you have access to EZ-Landmark you may download the Misty Fjords EZ-Landmark database here. This file adds 400 landmarks that are exclusive for the Misty Fjords scanty package. Printer-Friendly Plan - Rather than downloading this web page, you can download a 'Printer Friendly Plan' to use for your flight. You may download it [here]. 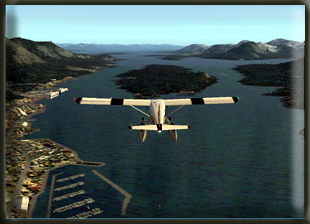 We are going to fly VFR from Ketchikan (PAKT) to the Stewart (CZST). It is quite easy to fly direct from Ketchikan to Stewart, simply go to 3000 feet and set your heading for Stewart (CZST) and fly there directly. But if you want to see this beautiful area from tree top level, down inside the very heart of Misty Fjords, then you will give yourself and any tourists on board a real thrill by letting them experience Misty Fjords up "CLOSE." You can set your autopilot on 2600 feet and have a safe flight, but if you want a little more excitement, fly the treetops and the wave tops. The details of the Misty Fjords scenery package are designed for up close scrutiny. There are US Forestry cabins to spot, cruise ships sailing down the channels, fishing boats in the coves, even waterfalls and navigational buoys and markers. Our flight will take us down the Tongass Narrows into the Revillagigedo Channel over Bold Island and finally turning into the Behm Canal. We will fly over Alava Bay, Smeaton and Winstanley islands before turning into Rudyerd Bay. Here you will be flying into the heart of Misty Fjords by following a mountainous maze through the Adam Mountains. You will then emerging into the beautiful Portland Canal and on to the scenic Stewart/Hyder area. Note: (You may click on the map to enlarge it for printing). Our trip starts at Ketchikan International airport (PAKT). 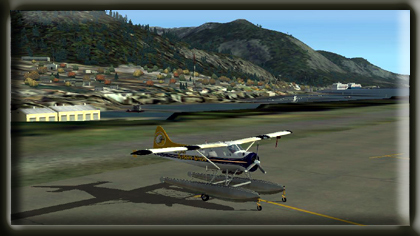 Be sure to download the correct weather to get the full effect of flying in Alaska. Do not be surprised if 8 out of 10 times, you will be looking at rain and mist ... there is a reason they call this area "Misty Fjords." 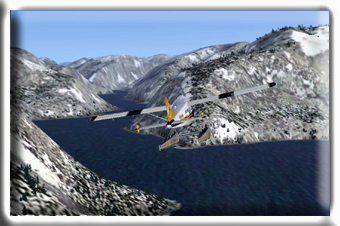 Your flight will be VFR, but you can use the FS2004 GPS in conjunction with the downloaded flight plans. Keep an eye out for the cruise ships that ply these waters as well as other commercial traffic, tugboats, ferryboats, towed barges, etc. These features are all included in the Misty Fjords Scenery package. The area we will fly through lies in the maritime climate zone noted for its warm winters, cool summers, and heavy precipitation. Average summer temperatures range from 46F to 59F; average winter temperatures range from 29F to 48F. The record high temperature is 97F; the record low is -4F.. Precipitation averages 163 inches per year, including 69 inches of snow! Stewart and Hyder: Stewart's setting can only be described in superlatives, combining an oceanfront location with alpine scenery, glaciers, ice fields, and spectacular waterfalls. This setting and the outdoor recreation opportunities it offers, contribute in an important way to the communities lifestyles. The area offers, fresh and saltwater fishing, boating, hiking, cross country skiing, snowmobiling, and numerous other activities. Stewart's colorful history has been dictated by the fortunes of the mining industry. The first exploration in the area took place in the late 1890's and the town site was named in 1905. An estimated 10,000 people resided in the area in the early 1900's, attracted by the prospects of gold; yet during World War I the population was reduced to less than twenty. Stewart was founded by two Scottish brothers, John and Robert Stewart. Major mines such as Premier Gold, Big Missouri and Granduc Copper have been established in the Stewart area. These projects created the impetus for population increases and attracted a skilled work force to the community. Mining is also primarily responsible for the development of support services such as heavy duty mechanics, welding shops, and transportation-related businesses, which provide service to all the basic resource industries. Today employment in the community is much more broadly-based and includes opportunities in transportation, mining, logging, retail and hospitality sector, and public administration. As a contact zone between the Coast Range Batholith and sedimentary formations to the east, the Stewart area is highly mineralized and contains proven reserves of a wide range of precious and base metals including gold, silver, copper, lead and zinc. Hyder was originally called Portland city, and the name was changed in 1914 after Frederick Hyder, a Canadian mining engineer who predicted a bright future for the area. Hyder's boom years occurred between the years 1920 and 1930, and the Riverside Mine extracted gold, silver, copper, lead, zinc and tungsten until 1953. By 1956, all major mining had closed except for Granduc Copper Mine in Canada, which operated until 1984. Hyder is known as the "Friendliest Ghost Town in Alaska." Hyder's economy is based primarily on tourism today. Visitors usually make more than one visit to Fish Creek bear viewing area, trying to view grizzlies and black bears as they feed on the spawning salmon. Continuing on past Fish Creek visitors will re-enter Canada and begin their assent to the Salmon Glacier. There are two public boat launching facilities to the Portland Canal one located in Stewart and one in Hyder. (See Note 1)Your first sight of Hyder and Stewart will be from the air and it is probably a site you will never forget. At the head of the Portland Canal, these two small towns are nestled in among the mountains, rivers, waterfalls and a lush forest. Keep your camera handy, but you won't need to aim it ... every shot, in ever direction will make a perfect picture. Let's get started. On the way to Bold Island, you will pass by Mountain Point on your left. The mountain to your right is Red Mountain and at its northern point where it meets the sea is the little community of China Town. It is interesting to note that China did a large trade in sea otter furs with the previous owner of Alaska, Russia. You will find many references to China in the area. To your right Annette Bay the body of water that is nestled between Red Mountain and the peninsula coming up on your right. The tip of the peninsula is Race Point. The large inlet to your left is Carrol Inlet which extends about 20 miles, part of it coming up behind Ketchikan. The small island showing up along your course just to the right is Spire Island. The large island ahead of you is Bold Island, our next waypoint. 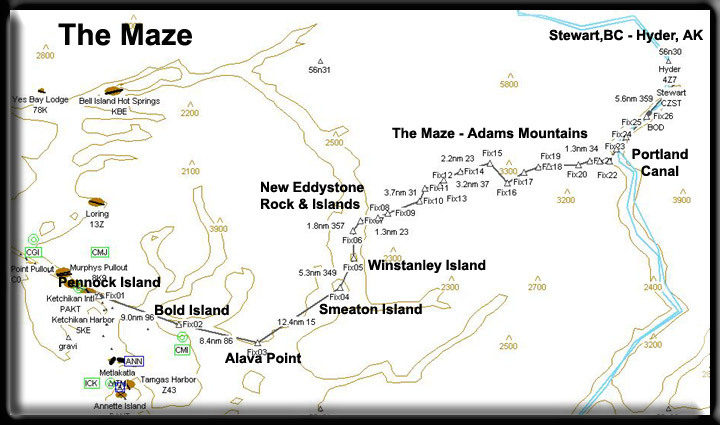 Once you are over the center of Bold Island, set a course Alava Point at a heading of 086, about 7 miles ahead. As you make your turn for Alava Point, you are passing the Thorne Arm to port. 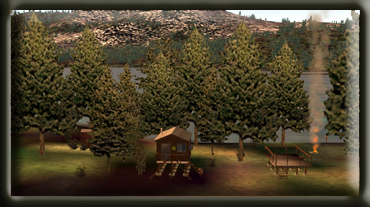 On the left point you will find Coho Cove complete with a small (virtual) settlement called Antelope Trail Ranch. (This is unique scenery in the Misty Fjords Scenery package). At the ranch, you will find a dirt runway, a Hangar for your plane, and down in Coho Cove a float plane Hangar and dock. On the right side of this inlet is Cone Island and Cone Point that define the southern entrance to the Thorne Arm. The point straight ahead of you is Alava Point. Once you arrive at Alva Point, set your course for 014 heading toward your next waypoint at Smeaton Island, 12.4 miles ahead. As you fly this leg, you have turned into the Behm Canal. This unique waterway completely circles the Ketchikan area. 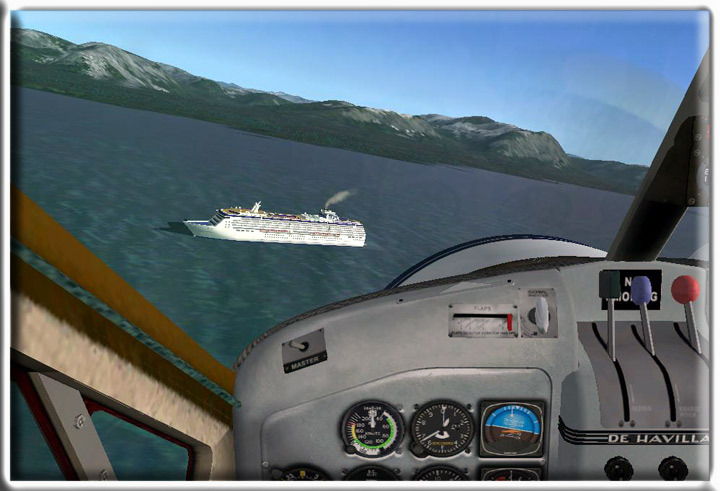 You will be flying directly over Alava Bay and will have your first chance to try to spot one of the famous US Forestry Misty Fjords cabins. Look closely and you will see it on the north side of large island in the center of Alava bay. (These cabins are visible in the Misty Fjords Scenery package). Look for a wisp of smoke from the chimney or the campfires usually burning in front of the cabin. Here's some information about this particular cabin and also some information on how the cabins are used. M-01, Alava Bay Cabin: (See Note 6) Access is by air and is approximately 20 miles southeast of Ketchikan. Other access is by boat approximately 1 1/2 hours travel time; mooring buoy is near by. Water is available from a stream nearby. Wildlife includes black bear and Sitka black tailed deer which may be hunted during regulated seasons. You can fish for saltwater species and in a nearby stream for Dolly Varden and cutthroat trout. Reservations: Reservations may be made up to 180 days (6-months) in advance of intended use. Applications will not be accepted more than 190 days prior to desired occupancy. Applications received earlier than this will be promptly returned with an explanation. If more than one application is is received between 180 and 190 days in advance of intended use for a cabin for overlapping dates, a drawing will be held to determine the permittee. Payments will be returned to unsuccessful applicants. Confirmed reservations may be made up to 179 days in advance of intended use on a first-come, first-served basis. Permittees must be at least 18 years old. Any number of persons can occupy a cabin under a single permit. The maximum stay at a cabin is (7) seven nights between April 1 and October 31, and (10) ten nights between November 1 and March 31. The advance payment is refundable upon written request, and return of the original permit, if it is received in the office from which the permit was issued from 10 days prior to intended use. Cabins are reserved from noon to noon. Cabin Facilities: The two most common types of cabins are A-Frames and Pan-Abode. Each can sleep at least four to six people. A-Frame cabins have an additional second floor sleeping loft. Each cabin includes tables, benches, plywood bunks (without mattresses), wood or oil heating/cooking stoves, axe/maul, broom, and pit toilets. Water: Water can be taken from nearby streams or lakes and should be boiled or treated before drinking. Although many of the rivers and steams appear crystal clear and give the impression that the water is pure, clarity is not an indication of the absence of bacteria or parasites. Whenever surface water is used for drinking or cooking, it should be treated or boiled for 5 minutes to avoid contracting giardiasis or other diseases. Giardiasis is an intestinal disorder which can be contracted from drinking untreated "natural" water. Equipment: You must bring your own bedding and cooking gear. Be sure to check the specific stove information for the cabin you desire. The Forest Service does not provide stove oil for cabin users. Oil can be purchased in the local communities. It MUST be #1 diesel oil for the stove to operate properly. Oil use varies from 5-10 gallons per week depending on the time of year and the weather. At cabins with wood stove, wood may be provided but must be split. Check with the Forest Service office administering the cabin for information on wood availability. An axe or maul is provided at cabins with a wood stove, but you should bring a small axe or hatchet just in case the tools at the cabin are not there. In all cabins it is recommended that a cooking stove be included in your gear. The wood/oil stoves do not usually provide sufficient heat for cooking. Trail Information Sheets: At cabins where trail access is possible or where trails are mentioned; request a trail information sheet from the Forest Service office administering the cabin. Safety: In the "old-days" thorough preparation and caution, using simple equipment and common sense, was a natural part of living and working in the wilderness of Southeast Alaska. Since then, conditions have changed little. Safety is still a matter of individual responsibility and is based on thorough knowledge of what to expect, the right equipment and common sense. Rain gear, rubber boots and warm clothing are essential. Extra food and clothing are recommended, as your stay could be prolonged by bad weather or poor visibility for travel. In remote locations, remember you are on your own! We recommend topographical maps, compass, waterproof matches, strong knife, first-aid kit, space blanket, small tent or emergency shelter, extra food, candles, and flares. For those experienced with firearms, a gun (30.06 or larger caliber) can be taken for unexpected emergencies. Bears: Remember that you are in bear country. Burn trash, or dispose of it so that bears are not attracted. Keep food items neat and clean to cut down on odors which may attract bears. Warn bears of your presence by making noise when in dense cover. "Bear Facts", a pamphlet on bear safety, is available from the Forest Service. Shellfish: Clam diggers should be cautious of Paralytic Shellfish Poisoning (PSP), PSP is an extremely poisonous toxin found in clams, mussels, geoducks, oysters, snails, and surface scallops. PSP can kill you--be careful where you clam. The brochure "PSP What you should know before you go clamming" is available from the Forest Service. Pack It In - Pack It Out: Maintenance of Forest Service cabins is very costly. To reduce these costs and the possibility of bear and rodent problems, all garbage and leftover food from your stay MUST be packed out. It is hoped that you will leave the cabin in the same condition or better than you found it. Leave a clean cabin so the next user will also enjoy their stay. Marine Mooring Buoys: Buoys are strategically placed to facilitate the anchorage of small boats in interesting areas otherwise unavailable due to a lack of good anchor "holding ground". A reservation at a Forest Service cabin does not include exclusive use of the buoy if one is located near the cabin. Buoys are on a first-come first-serve basis. Rafting of more than one vessel is permitted with the agreement of each vessel owner. Three vessels that are less than 21 feet or two vessels between 21 and 30 feet are allowed to tie up to an anchor buoy. Do not anchor vessels over 30 feet on mooring buoys. PLEASE limit moorage to 36 hours. Still want to try a cabin? Imagine the kinds of gear you'll be storing on board your aircraft taking people to these cabins ... axes, 30.06 rifles, #1 diesel oil? Could be an interesting trip! We will watch for more cabins along the way. Your course is now taking you over the small Rudyerd Island. When you fly over Rudyerd Island, Smeaton Island will be 4 miles ahead. We are continuing to fly up the Behm Canal. To the right of our course is Nelson Point and to the left of Smeaton Island is Princess Bay. Once over Smeaton Island, set your heading to 353 so you will fly toward Winstanley Island the long island about 5.3 miles ahead of you. As we fly toward Winstanley, here are a few facts about it the Misty Fjords National Monument we will be flying into. The Misty Fjords National Monument includes 2,294,343 acres on the southern tip of the Alaska Panhandle, all but about 156,000 acres near the middle have been designated Wilderness. Misty Fjords is part of a vast coastal rain forest and the cloud-shrouded monument can receive 160 inches of rain annually. The region is marked by deep valleys with steep slopes and sharp inter-valley ridges formed by volcanism and carved by glaciation. The slopes appear to be an unbroken carpet of cedar, spruce and hemlock, but the forest floor stands open at numerous muskegs dominated by sphagnum moss. Ridges rise above the timberline to alpine heaths and grasses. Numerous steep-walled inlets of the sea called fjords offer excellent sea-kayaking opportunities, although 25-foot changes in the tides and frequent storms can make boating challenging. Ideal beach camps may be underwater two hours after pitching a tent. Behm Canal that we are currently flying over is the longest waterway into the Wilderness, runs for over 100 miles and old lava flows and extensive glaciers add to the wonder. As we mentioned previously, Tongass National Forest maintains 15 recreational cabins, 12 are on inland freshwater lakes and 3 on saltwater. One of the saltwater cabins will pass under us at the north end of Winstanley Island. The Winstanley Island Cabin is located 30 miles slightly north east of Ketchikan on East Behm Canal between Rudyerd Bay and Smeaton Bay. The cabin is on the north end of Winstanley Island facing Shoalwater Pass. The cabin is both accessible by air and water. Watercraft travel takes approximately 3 hours. Drinking water is available from a nearby stream. Several hunting areas are available by boat. The cabin is available all year long. (See Note 6)Over Winstanley Island, set a heading of 340 and this heading will take us over the tiny New Eddystone Islands. You will begin to see the entrance of Rudyerd Bay coming up on your starboard at about 2 o'clock. Once over the New Eddystone Islands, set your heading at 001 flying to the center of the entrance of Rudyerd Bay rounding Louis Point. This is the "entrance to the maze" we'll be flying for the next 25 minutes. From this point on until we reach the Portland Canal, we'll concentrating on the flying as the waypoints and flying can be hazardous. We are going to fly into the heart of the Adams Mountain range following river valleys to finally reach the Portland Canal. There are some sharp turns and we'll have to pay close attention and use all our flying skills to navigate this next part of the leg safely. Fix 7 - Entering Rudyerd Bay Rounding Louise Point on our right, we will now fly into Rudyerd Bay. DO NOT fly lower than 1700 feet in the maze! Here the bay branches to the left and right. The right branch is Punchbowl Cove. Just beyond Punchbowl Cove, over the small mountain, is the beautiful Punchbowl Lake. We will be taking the left branch which is the continuation of Rudyerd Bay. On these next fixes, we will be winding our way up Rudyerd Bay and into the Adams Mountains. You will be seeing the very heart of the Misty Fjords National Park, up dangerously close and exquisitely beautiful. Be ready for a sharp starboard turn at fix 15, buckle up, it is a white knuckle turn. You should be increasing your altitude toward 2600 feet minimum. You will see a "Y" intersection ahead of us, we will be taking the left branch. At this fix, we are going to take a sharp turn to the right to head toward the Portland Canal which is on the other side of the Adam Mountain range. If you have been flying less than 2600 feet, this would be a wonderful time to make sure you are increasing your altitude toward 2600 feet (check that barometer one more time and make sure you have it set correctly ("B"). The highest point in this flight will be just beyond Fix 17. Make sure you are at 2600 feet! Here you get your first glimpse of the open beauty of the Portland Canal. Once you clear the final peak, you may safely reduce altitude to 1200 feet or to any altitude you like. The airport you will be landing at is at sea level and you'll be headed right toward it..
Once into the Portland Canal, you can make a turn to 019 and begin centering up on your final heading for Stewart. We are now approaching the Stewart airport. As it comes into view, on your left you will see the Salmon River winding down from the glacier. The little community on the left is Hyder. Ahead of us is the community of Stewart and our destination, Stewart airport (CZST). Visiting Stewart and Hyder - Things to know, see and do. To learn more about Stewart, BC you should visit the website of http://www.stewartbc.com/. This website has the history, folklore stories about the area. It is a must read if you would like to know more about this area. Situated at the end of the Portland Canal and across from Alaska's Misty Fjords National park, Stewart is a unique border town attracting as many American tourists as Canadian. Important to the economy are the industries of forestry and mining - the main employers in the town. The community is promoting the development of a wood processor and is endeavoring to cultivate bulk cargo for its port. You should try to visit the famous Bear Glacier, one of the few blue glaciers with the easiest access in the world. Also, take a walk on one of the hiking trails that reveal the evidence of old gold and silver mines as they take one on a walk through the magnificent coastal forest, mountain streams and alpine meadows. Be sure to try the amazing fishing in the numerous streams and lakes. You can watch the spawning of the rare Alaskan Chum Salmon at Fish Creek. If saltwater fishing is your thing, make sure to take a boat ride on the Portland Canal to catch prawns and crabs...or maybe see a majestic killer whale. Don't miss out on the spectacular drive from Stewart to Hyder and follow the road through the Salmon River valley right up to the old Granduc mine along the Berendon Glacier. Keep your eye out for the spectacular view of Salmon Glacier, it is the fifth largest glacier in the world. You can easily take your car or RV on this road, but if you wish, there are some fun tours as well. Stewart, BC is a small town big in history, nature and beauty. Mining was Stewart's beginning when 68 prospectors came to the head of the Portland Canal in the spring of 1898 looking for placer gold. Although rumors said the deposits equaled those of the Klondike, the promised "poor man" placer never materialized. However, other gold camps, once attention had been drawn to the area, mining and exploration increased. Stewart is on the Cassiar Highway at the head of the Portland Canal, a narrow saltwater fjord approximately 90 miles/145 kilometers long. The fjord forms a natural boundary between Alaska and Canada. Stewart has a deep harbour and boasts of being "Canada's Most Northerly Ice Free Port". Prior to the coming of the white man, Nass River Indians knew the head of the Portland Canal as Skam-A-Kounst, meaning safe place, referring to the place as a retreat from the harassment of the coastal Hiadas. The Nass came here annually to hunt birds and pick berries. Little evidence of their presence remains today. In 1896, Captain D. Gillard (after whom the Gillard Cut in the Portland Canal was later named) explored the Portland Canal for the U.S. Army Corps of Engineers. Two years after Gillards visit, the first prospectors and settlers arrived. Among them was D. J. Raine, for whom a creek and a mountain in the area are named. The Stewart brothers arrived in 1902, and in 1905, Robert M. Stewart, the first postmaster, named the town Stewart. Hyder was first called Portland City. It was renamed Hyder, after Canadian mining engineer Frederick B. Hyder, when the US Postal Authority told residents there were already too many cities named Portland. Gold and silver mining dominated the early economy. Hyder boomed with the discovery of rich silver veins in the upper Salmon River basin in 1917-1918. Hundreds of pilings, which supported structures during this boom period, are visible in the tidal flats at Hyder and Stewart. Despite the many changes in population from a high of 10,000 prior to the first world war, to a low of under 700 today, Stewart has always and will continue to persevere. (See Note 4) (See Note 5). We hope you enjoyed the trip. Be sure to check back at Misty Moorings, Inc. for more flights in this beautiful area of the world. Our thanks to the following websites for information. It is highly suggested you go to many of these websites to learn more about this area of the world. We were only able to put in a small amount of information here hoping to tempt you to go to these websites and learn more.